As the winter beds of the Community Garden and Orchard rest, review of a successful growing season is due. 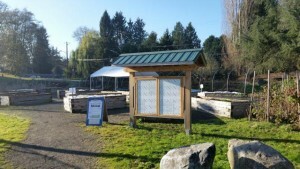 One of the ‘tools’ now available to volunteers is the recently completed community garden kiosk. Strategically located, the info station will invite and display events and opportunities. Sharp lookin’! 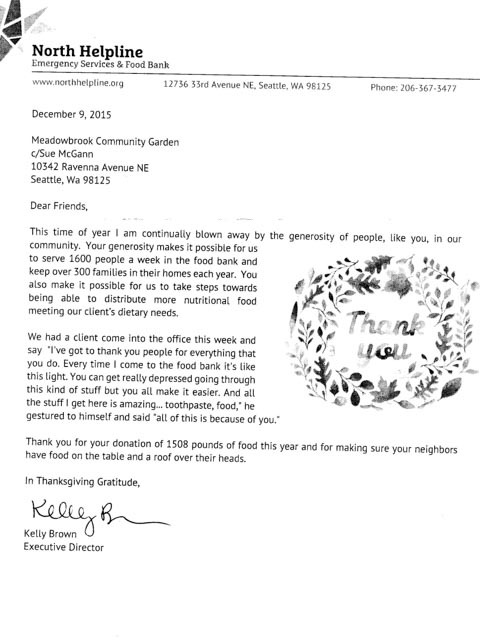 Another highlight is the 2015 harvest production report from North Helpline Food Bank. Previous years donation numbers to the food bank have given volunteers goals to realize. It is hoped that the goal of supporting the local food bank, sharing the story on site and engaging interested citizens on gardening news and learning is a formula for future community interest and progress. With expansion of growing space and dedicated volunteers, the future looks bright. As the letter states, 1508 lbs. of fresh vegetables and fruit were sent to the local food bank. This new record of food production and giving will energize volunteers. It is also information that can be shared with passers-by at the new kiosk. Take a peek, harvests also go to the cooking classes at the Meadowbrook Community Center and Community Shelter Meals at the Maple Leaf Lutheran Church. With abundant opportunities in harvesting on the multi acre site, the goal of creating awareness and inclusivity is on track.